The Diamond Heart Ketubah is for the head-over-heels, passionately in love, over the top, cheesy romantics! 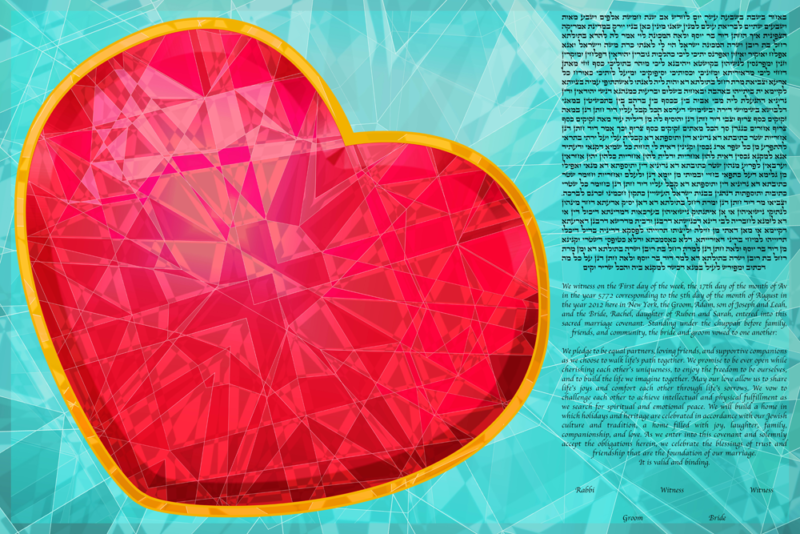 Between the bursting red heart and diamond design, this Ketubah absolutely shines with color and affection. The crystal blue background and fiery red creates a stunning contrast of softness and passion — the perfect balance for any Ketubah… and relationship! This dazzling work of art is perfect for the couple that celebrate their love every day of the year. Wether it’s a single red rose or a cute lipstick note on the mirror before work, neither of you ever need an excuse to be utterly romantic! The Diamond Heart Ketubah will both beautifully capture your love and celebrate your commitment.